What is kerning and what is the point of it? From what I see here, it seems kerning is just rearranging the space between letters. However, the comments here lead me to believe there's more to the story. Is kerning really that simple? Is the only purpose of it to look nicer or is there some practical reasoning for it? I think the Wikipedia kerning article essentially covers it, but the bulk of the article is about adding kerning information to a font during its design, or applications automatically using this built-in information to improve composition of a font's characters -- rather than the a fine-tuning a designer might do on a particularly problematic pair of characters in a headline. was launched; that combination of italic/oblique and roman characters would probably not have been foreseen by the font designer, and so would require special treatment to avoid the dot of the i from colliding with the V.
Letter-letter, or letter-punctuation combinations that are only used in some languages are other situations that might require custom kerning by a designer. Also to note, fonts contain widely varying amounts of kerning information - this is one of the key differentiators between amateur and professionally produced fonts, or even between different versions of the same font. In typography, kerning (less commonly mortising) is the process of adjusting the spacing between characters in a proportional font, usually to achieve a visually pleasing result. In a well kerned font, the two-dimensional blank spaces between each pair of characters all have similar area. 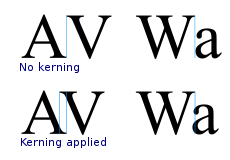 The related term kern denotes a part of a type letter that overhangs the edge of the type block. The main reason to pay close attention to kerning is for readability. Visual appeal is also very important. Another reason is that a properly kerned word will typically take up less horizontal space than an unkerned word, therefore allowing larger type sizes (this is useful for book cover design and poster design). Not the answer you're looking for? Browse other questions tagged typography kerning or ask your own question. Adobe InDesign/Typesetting: No kerning possible for first letter in indented line? What's the term of what I need to fix here - Umlaut dots missing at 80% zoom? Why have different font faces for title, text body and graphs in texts?